﻿ Saint-Petersburg, Russia. St.Petersburg travel seasons - Winter. The first snows fall in November. The Neva starts to freeze in great ripples of ice. The City takes on a new romantic quality as snow shrouds its famous landmarks and buries its parks in an icy mantle. Made more temperate than Moscow by the waters of the Finnish Gulf, the snows come and go before setting into a thick white cloak soon after New Year. This is the time for Troika rides in the countryside and steaming bowls of Borscht. Restaurants in the main hotels offer choices of Russian and international cuisine and bars and restaurants throughout the City provide a good choice of traditional Russian home cooking and international options. Ballet and Opera are a major part of the City's winter attractions. The works of Russia's most talented musical sons Tchaikovsky, Stravinsky and Rimsky-Korsakov are at their best performed here in their cultural homeland. The Russian festive season combines two Christmases and two New Years! So there is plenty to celebrate! 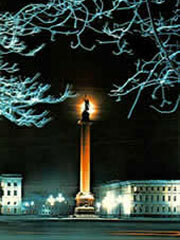 As Russia re-discovers Yuletide traditions, long forbidden and forgotten, the big celebration is still New Year. That is when Father Frost alias Father Christmas, comes to town and the City puts on its glitziest face and parties until dawn.